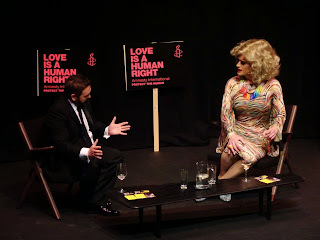 The annual Amnesty NI Belfast Pride lecture was delivered by Panti Bliss this evening in The MAC. The packed audience listened to Panti's forty five minute address [MP3 download] which took in reaction to her comments on RTE (which resulted in legal action) and her subsequent after-show speech in the Abbey Theatre. 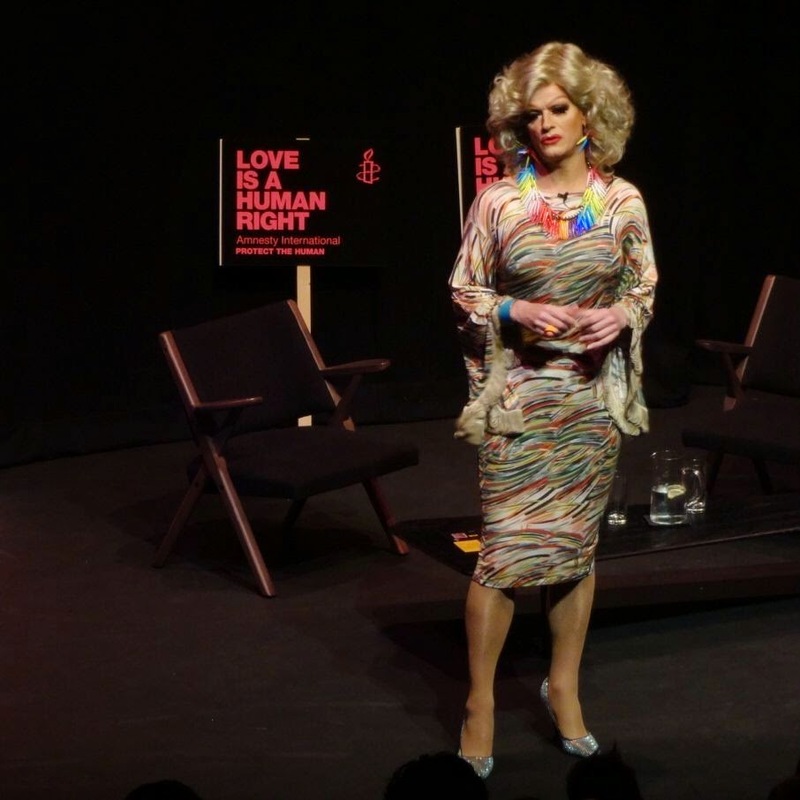 During the talk, Panti looked at many of the common arguments put up by anti-gay campaigners and tried to debunk them, including some of those raised by EANI's Peter Lynas and callers to this morning's Stephen Nolan show. Why should those attacking equal marriage and other gay rights issues be allowed to define what gay people should judge to be homophobic? Smart, witty, and avoiding over-stereotyping those who oppose extending gay rights, Panti was rewarded with a standing ovation at the close of her speech. Féile an Phobail – sometimes known as the West Belfast Festival – is now underway, running until 10 August. The programme is 100 pages thick; the festival is enormous, taking in music in the 5,000 capacity tent in Falls Park, drama, debate, talks on the First World War and Palestine Day, sport, tours and sessions in pubs and libraries. On the Journey to Peace and Reconciliation at 8pm in St Mary’s University College // Colin Parry’s 12 year old son was killed when an IRA bomb exploded in Warrington in 1993. He’ll be sharing his journey along with deputy First Minister Martin McGuinness. Hidden History: Protestants and the Irish Language at 3pm in St Mary’s University College // Linda Ervine speaking about the influence of the sometimes unexpected Irish language on places, words and organisations, and debunking the myth that Irish is to feared. Shrieking Sisters at 7.30pm in the Library at Coláiste Feirste // In the early hours of 1 August 1914 a group of suffragettes led by Lilian Matge attempted to blow up Lisburn Cathedral. The drama asks what made a respectable middle class supporter of women’s rights resort to active militancy? Written by Maggie Cronin and Carol Moore, and joined on stage by Laura Hughes. £7. Human Rights & Investigative Journalism at noon in St Mary’s University College // Amnesty’s annual event returns with investigative journalist Iain Overton. He has exposed the truth about CIA drone attacks, deaths in police custody and been witness to the devastating impact of armed violence – making documentaries under fire in Somalia, Iraq and Colombia. Chaired by Malachi O’Doherty. An End to the Drift or a Drift to the End: Protestants and Politics in Contemporary Ireland at noon in Clifton House // A self-confessed dissenter, researcher and writer Robbie McVeigh offers a radical re-envisioning of Irish Protestant identity as a way out of present discontents. Haiku Peace & Prayer Flags Workshop at 1pm in Cultúrlann //Embrace your inner poet, write a haiku, express it on fabric and string it up as a Tibetan prayer flag! Free, for children aged 8 to 13. Contact kevin at feilebelfast dot com or 028 9031 3440 to book a place. Ceasefire at 7pm in St Mary’s University College // Twenty years on from the ceasefire announcements from the IRA and the Combined Loyalist Military Command, journalists reflect on those headlines and the beginnings of a new peace. Eamonn Mallie, Charlie Bird, Ivan Little, Judith Hill and Brian Rowan. The Wheelchair Monologues at 8pm in Cultúrlann (runs Tuesday 5–Thursday 8) // Aisling Ghéar’s one-man show, in which Gearóid Ó Cairealláin takes a look back over the ups and downs of his wheelchair bound life since suffering a haemorrhagic stroke at the age of forty-eight. The man who founded the Irish language daily newspaper Lá and co-founded both the Cultúrlann and Raidió Fáilte has slowed down somewhat. But his spirit and zest for living remains. In Irish with live translation into English via personal headset. West Belfast Youth Talks Back at 2pm at Whiterock Leisure Centre // Anna Lo (Alliance MLA), Stephen Corr (Sinn Féin councillor), Sean Connolly (local author) and other as-yet unnamed panellists will be joined by chair Yvette Shapiro. West Belfast Talks Back at 7pm in St Louise’s Comprehensive College // Noel Thompson hosts this year’s panel discussion. Confirmed panellists include Fr Tim Bartlett (Catholic Church), Rev Lesley Carroll (Presbyterian Church in Ireland), Danny Kennedy (UUP MLA, Minister for Regional Development) and John O’Dowd (SF MLA, Minister for Education). Dealing with the Past: Hugh Orde in Conversation with John Ware at 3pm in the Balmoral Hotel // Hugh Order was the first Chief Constable of the PSNI and is now President of the Association of Chief Police Officers. He’ll be speaking about dealing with our past and truth recovery with well-known investigative journalist John Ware. Relatives for Justice chair Clara Reilly will open the two hour event, and Denis Bradley will make the closing remarks. Poppy and Lily at 3pm in Felons Club // Historian Philip Orr and Joe Austin from the National graves Association will discuss these two symbols. The Story of Philomena at 1.30pm in St Mary’s University College // Martin Sixsmith speaking about his introduction to the story of Philomena Lee, an unmarried mother whose son was taken away from her at the age of three because he was born out of wedlock. The story became a book and a much talked-about film. Walking Tour of Belfast City Cemetery at 2pm daily from Saturday 2 to Saturday 9 August. Tom Hartley tells the story of the city’s troubled history, its rich, its entrepreneurs and empire builders in a tour that promises to “upend old stereotypes and provide a fresh approach to the history of Belfast. £5, pay at gate. Tom’s book on Belfast City Cemetery is also relaunched tonight. Available for £13 on Amazon as well as local bookshops. It’s the middle of the summer and Belfast will shortly host a couple of large festivals. Amongst the dancing, music, drinking and parading, Belfast Pride Festival throws in film, plays, comedy, debate, faith as well as workshops on fostering, adoption, health and well-being workshops. The festivals tagline this year is Diverse - Equal - Proud. The Lark in the Park and Family Fun Day will be held in Ormeau Park from noon on Sunday 27 July with circus performers, storytelling, face-painting, Segways as well as a basketball free-throw competition, tennis, roller derby, soccer, GAA and an egg and spoon race. There’s a singalong screening of Mamma Mia! on the City Hall’s big screen on Sunday 27 July. Gates open 6pm, film starts 7pm. The event is free, but you need to pre-register for a ticket. All Souls Church on Elmwood Avenue will be open for prayer and reflection from 6.30pm to 8.30pm on Monday 28, Wednesday 30 and Friday 1 August. It will also be the venue for the Annual Pride Service on Sunday 3 August at 3pm. GLYNI (Gay & Lesbian Youth NI) are holding their annual debate/question time in the Black Box on Monday 28 July at 7pm. The panel and audience, chaired by William Crawley, are expected to cover religion, transgender rights, gay cakes, HIV stigma and more. 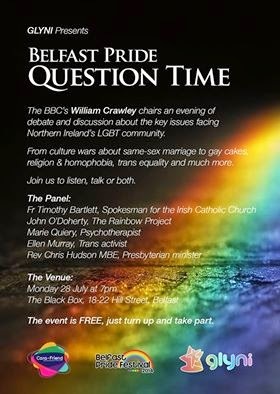 The panel will include: Fr Timothy Bartlett (Spokesman for the Irish Catholic Church), John O'Doherty (The Rainbow Project), Marie Quiery (Psychotherapist), Ellen Murray (Trans activist), Rev Chris Hudson MBE (Non-Subscribing Presbyterian minister). 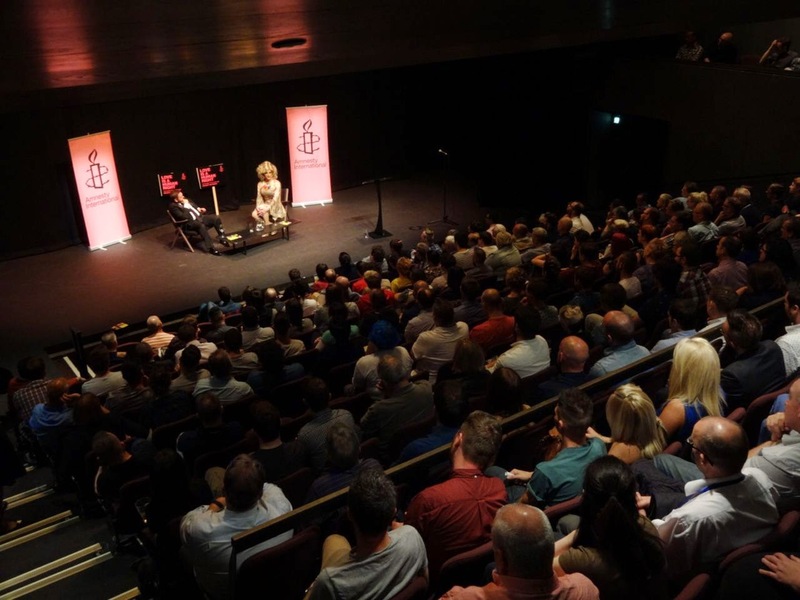 Action for Equality replaces Pride Talks Back this year as the Equality Commission-supported event aims to move beyond political discussion to give a wider range of voices a chance to share and discuss practical ideas about speaking up for change and delivering equality in their communities. Ulster Hall Group Theatre at 7pm on Tuesday 29 July. An Educating the Educators workshop takes place in UU’s Belfast Campus on Wednesday 30 July at 6pm, with GLYNI, BELB and UU School of Law combining to help those working with young people best support people coming to terms with their sexuality or gender identity. Registration required. Pádraig Ó Tuama will host An Exploration of Christian Voices in Uganda in the Black Box on Wednesday 30 July at 6pm. Pádraig travelled to Uganda in 2013 and will explore some of the roots and international connections of the anti-homosexuality bill. Immediately afterwards at 7pm the Tenx9 storytelling event will give nine people up to ten minutes to tell a real story from their lives abut labels chosen, labels imposed or even the importance of redefining or rejecting labels. As part of Féile an Phobail, the Rainbow Project host Different Jurisdictions and Different Roads to Equal Marriage in St Mary’s University College at 12.30pm on Friday 1 August. A panel will discuss international trends - eg, France passed federal marriage statutes whereas some American states have relied on judicial review to guarantee citizens’ rights - and ask how this affects the marriage equality movements on the island of Ireland? Rhoda Cameron will escape the Commonwealth Games to be amongst the comics at Comedy Night in the Black Box on Friday 1 August from 8pm. And at the same up the road in University of Ulster’s Orpheus Building, the UUB LGBT society are running a movie night with tea, coffee, popcorn and sweets thrown in with an as yet unadvertised movie for £3. The 24th Belfast Pride Parade leaves Custom House Square at noon on Saturday 2 August, and will snake down Donegall Street before marching the length of Royal Avenue and Donegall Place, anticlockwise around the City Hall, down North Queen Street and along Castle Street and High Street to return to Custom House Square. 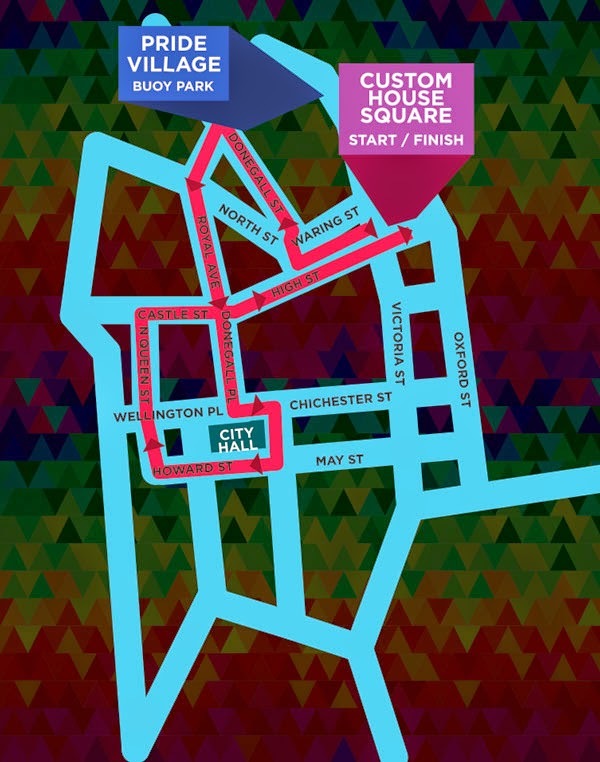 The largest cross-community festival parade in Belfast is followed by Party in the Square with Stooshe, Misha B, The Björn Identity and many more from 1.30pm onwards. There’s a family zone in the Pride Village in Buoy Park (between the UU Art College and St Anne’s Cathedral) with stalls, children’s entertainment and coffee. Check older posts about previous Pride festivals and interviews back in 2012 with Christian groups supporting and opposing the parade. 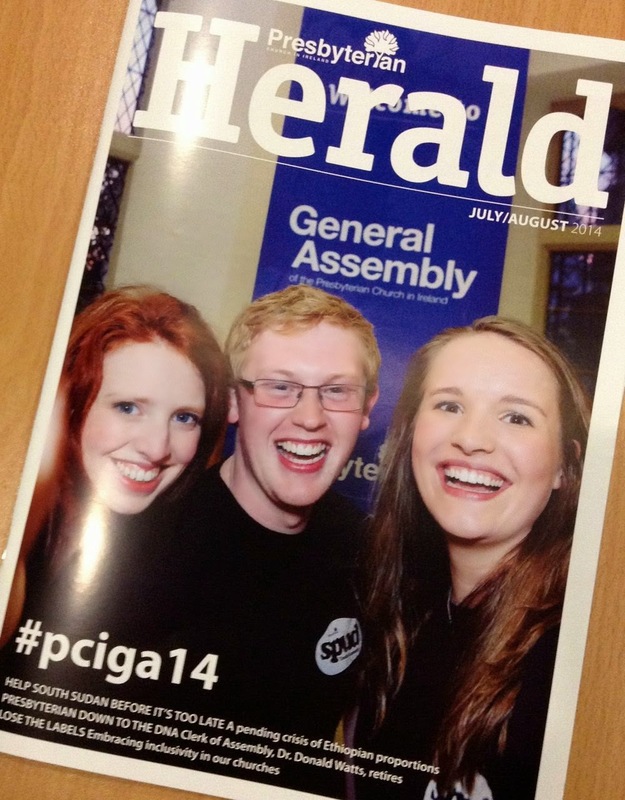 I wrote a piece for the Presbyterian Herald magazine offering some personal reflections on June's General Assembly. It's reproduced below, along with a few extra sentences that missed the final version due to (already generous) word count restrictions! Your comments and feedback welcomed. What kind of a General Assembly was it when Presbyterians returned to the comfortable air-conditioned Assembly Buildings in Belfast after their sojourn in Derry’s Millennium Forum 12 months ago? The opening night started strongly. Dr Barry called on the church to “look not only on your own interests but also to the interests of others” and speaking out against civic rioting and those “who would attack verbally or physically people they do not like”. He contrasted the tendency to say “come and listen to us” with Jesus’ command to “go into all the world”. Overnight this message was picked up by the front page of the News Letter and for once the denomination was there for the right reason. But did PCI continue to be so challenging throughout the rest of the week’s business? Despite the nearly equal numbers of ministers and elders who can register to attend the General Assembly, there was an overwhelming clericalism. Apart from the singers and musicians – and a cameo appearance by moderatorial runner-up Rev Liz Hughes – the opening night was once again dominated by men wearing clerical shirts. Does this really epitomise how we want Presbyterian democracy and governance to be seen and heard? For the first time I heard complaints about a queue forming for the women’s toilets during the breaks in business. Given the tiny minority of women ministers (remember less than 40 have been ordained by PCI in the last 40 years) and the vast majority of male elders, this was a significant and long overdue queue. We should welcome the small increase in the number of elders speaking in Assembly debates. However, despite their vote being equal, non-clerical voices were very much still in the minority. The Clerk and Moderator might consider encouraging the full participation of all those ‘in the house’ during every session and not just at the introduction to Assembly business on the first morning. Since its inception in 2007, the SPUD (Speaking, Participating, Understanding, Deciding) youth initiative has been as much about “listening to the views of others and to the rest of the church” as it has been about making the voice of young people heard in the General Assembly. SPUD neatly summed up their contribution: 1 report, 5 speeches, 3 resolutions, 150 bacon/sausage butties, over 500 cups of tea/coffee, 500 tray bakes, serving God and blessing the Church. Their focus was on relationships and networking, making the vacant Familybooks unit into a space for prayer, a haven of hospitality, an acoustic café late on Wednesday evening, and over Thursday lunchtime a venue for a discussion about sharing our faith and how to be a people of service and outreach. Our denomination should celebrate the example of the 12 SPUD delegates: listening, relating, serving, feeding and challenging. The week of General Assembly is an odd mix of a Christian worship festival, a theology symposium, a corporate Annual General Meeting of shareholders, and a trade union rules revision conference. In behind the scenes, an army of office staff, building managers, clerks, stewards, IT support, sound and video engineers, not to mention the caterers and those who look after delegates visiting from other denominations and countries, invisibly hold the Assembly together. 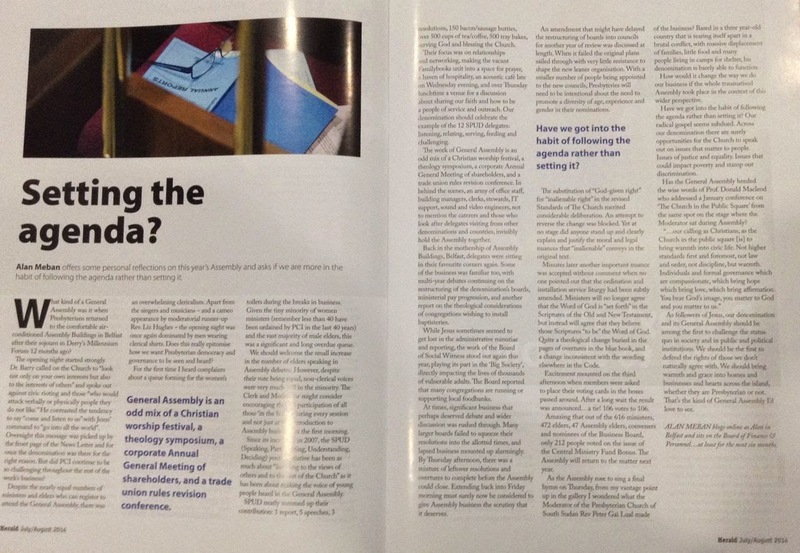 This year it was impossible not to compare and contrast this year’s General Assembly with the experience from twelve months ago up in Derry’s Millennium Forum. A majority of delegates in 2013 were residential, spending 72 hours living, eating, socialising, worshipping and debating together up in the north west. The relaxed atmosphere included the chance to walk around the walls to First Derry for communion, showing off the City of Culture’s heritage in the fabulous weather. Ministers and elders who normally only pop into General Assembly for a day stayed for the duration. There were lots of new faces at the opening night and Wednesday rally. Back in the mothership of Assembly Buildings in Belfast, fewer people needed to stay over and were around to let their hair down in the evenings. In familiar surroundings, delegates sat in their favourite corners again. Some of the business was familiar too, with multi-year debates continuing on the restructuring of the denomination’s boards, ministerial pay progression, and another report on the theological considerations of congregations wishing to install baptisteries. While Jesus sometimes seemed to get lost in the administrative minutiae and reporting, the work of the Board of Social Witness stood out again this year playing its part in the ‘Big Society’, directly impacting the lives thousands of vulnerable adults. The Board reported that many congregations are running or supporting local foodbanks. At times, significant business that perhaps deserved debate and wider discussion was rushed through. Many larger boards failed to squeeze their resolutions into the allotted times, and lapsed business mounted up alarmingly. By Thursday afternoon, there was a mixture of leftover resolutions and overtures to complete before the Assembly could close. Extending back into Friday morning must surely now be considered to give Assembly business the scrutiny that it deserves. An amendment that might have delayed the restructuring of boards into councils for another year of review was discussed at length. When it failed the original plans sailed through with very little resistance to the shape of the new leaner organisation. With a smaller number of people being appointed to the new councils, Presbyteries will need to intentional about the need to promote a diversity of age, experience and gender in their nominations. The substitution of “God-given right” for “inalienable right” in the revised Standards of The Church merited considerable deliberation. An attempt to reverse the change was blocked. Yet at no stage did anyone stand up and clearly explain and justify the moral and legal nuances that “inalienable” conveys in the original text. Minutes later another important nuance was accepted without comment when no one pointed out that the ordination and installation service liturgy had been subtly amended. Ministers will no longer agree that the Word of God is “set forth” in the Scriptures of the Old and New Testament, but instead will agree that they believe those Scriptures “to be” the Word of God. Quite a theological change buried in the pages and pages of overtures in the blue book, and a change inconsistent with the wording elsewhere in the Code. Excitement mounted on the third afternoon when a vote was finally close enough that a simple oral Aye/No followed by up a standing vote (counted visually by tellers) were insufficient and members were asked to place their voting cards in the boxes passed around. After a long wait the result was announced … a tie! 106 votes to 106. Amazing that out of 616 ministers, 472 elders, 47 Assembly Elders, conveners and nominees of the Business Board, only 212 people voted on the issue of the Central Ministry Fund Bonus! The Assembly will return to the matter next year. As the Assembly rose to sing a final hymn on Thursday, from my vantage point up in the gallery I wondered what the Moderator of the Presbyterian Church of South Sudan Rev Peter Gai Lual made of the business? Based in a three year old country that is tearing itself apart in a brutal conflict, with massive displacement of families, little food and many people living in camps for shelter, his denomination is barely able to function. How would it change the way we do our business if the whole traumatised Assembly took place in the context of this wider perspective. Have we got into the habit of following the agenda rather than setting it? Our radical gospel seems subdued. Across our denomination there are surely opportunities for the church to speak out on issues that matter to people. Issues of justice and equality. Issues that could impact poverty and stamp out discrimination. Has the General Assembly heeded the wise words of Prof Donald Macleod who addressed a January conference on ‘The Church in the Public Square’ from the same spot on the stage where the Moderator sat during Assembly? As followers of Jesus, our denomination and its General Assembly should be among the first to challenge the status quo in society and in public and political institutions. We should be the first to defend the rights of those we don’t naturally agree with. We should bring warmth and grace into homes and businesses and hearts across the island, whether they are Presbyterian or not. That’s the kind of General Assembly I’d love to see. Finally visiting Titanic Belfast, twenty-seven months after it opened! Oddly until today I’d never set foot in the exhibition halls of Titanic Belfast. More than two years after its opening in the centenary year of the ship’s launch, I’ve been up in the top floor conference venue more times that I can recollect, but had never made it as far as the displays downstairs. 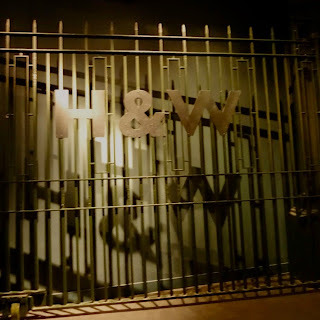 Titanic Belfast certainly goes out of its way to set 1912 Belfast in context, with early galleries introducing visitors to the linen industry, the local political situation and the scale and technology behind Belfast’s ship-building tradition. It is clear that the museum and the city are celebrating more than one single boat. The short themepark ride was a welcome chance to take the weight of our legs and flew us through the noisy shipyard. Later there was footage of the Titanic’s launch and detail about its intricate fit out. The ship’s sinking is handled sensitively and is not sensational. Morse code transmissions and survivor statements provide glimpses into the horror of that April night. Where the exhibition is at its weakest is in telling the stories of the passengers and crew, whether lost in the accident or survivors. Touch screens tucked into a corner offer access to the passenger and crew lists, allowing them to be sorted by age, gender, class/crew role, port of embarkation and whether they survived. 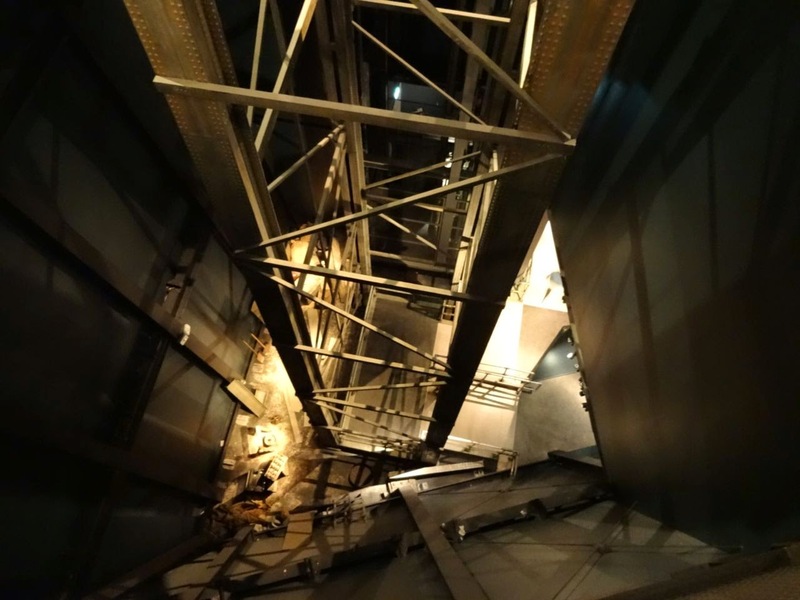 However, detail about individual passengers was scant with a only few static displays dotted around the building’s galleries picking out particular stories. As a local visitor I wanted to be told about the men from off the Newtownards Road who didn’t return, to place their names and their stories in the local community. And I really wanted to be overwhelmed by the human scale of the tragedy: maybe to have had to walk through a dark tunnel with the surnames being randomly projected at angles onto the walls and ceilings. Somehow I didn’t want to be allowed to so easily stand back and opt out of any emotion. While there’s a gallery dedicated to the US and UK inquiries that followed the sinking and some audio-visual reconstructions of key exchanges, the information is high-level and there is no access to more detail. While even the hour-long Titanic Inquiry docudrama by the Hole in the Wall Gang doesn’t do full justice to the questions around SS Californian’s lack of curiosity about the nearby shipping firing distress rockets, there is little room on the walls of Titanic Belfast to explore these events without recourse to a local titanorak or a guided tour. Perhaps hiring an audio guide unit would have filled in a lot more of this detail and told alternative stories? I’ve just discovered that the reason some visitors seemed glued to earpieces plugged into their iPhones and iPads was the £1.49 audio app for Titanic Belfast (available in six languages). It’s a shame this isn’t more prominently advertised throughout the building (which has seemed to have excellent wifi in every nook and cranny). Titanic Belfast is certainly attracting tourists with a multitude of languages heard and overseas visitors seen walking around the building this afternoon. The staff crew are a major asset and the galleries seem to be organised so you’ll have to you’ll walk past a member of staff every half hour or so. They were all bubbly, approachable, but not pushy or nosey: a credit to the attraction and a major part of its success. Like all museums and visitor attractions, some screens were dead and some lights/buttons were no longer working or missing (eg, the morse code keys in an early gallery). Attention to detail and rapid maintenance is often the sign of truly world-class venues. Every now and again it was a delight to find a corner of a gallery or a balcony overlooking the atrium with no atmospheric sound effects in which to rest and get a break from the auditory turmoil. Compared with other touristy attractions I’ve visited in Europe over recent summers, the Titanic Belfast souvenir shop doesn’t seem to be too overpriced. (It was good to see that there’s been no tea-bag price inflation since 2012 with the price of Thomson's Titanic tea steady at £2.99, not far above the supermarket retail price). Overall, we spent two and a half hours wandering through the galleries. 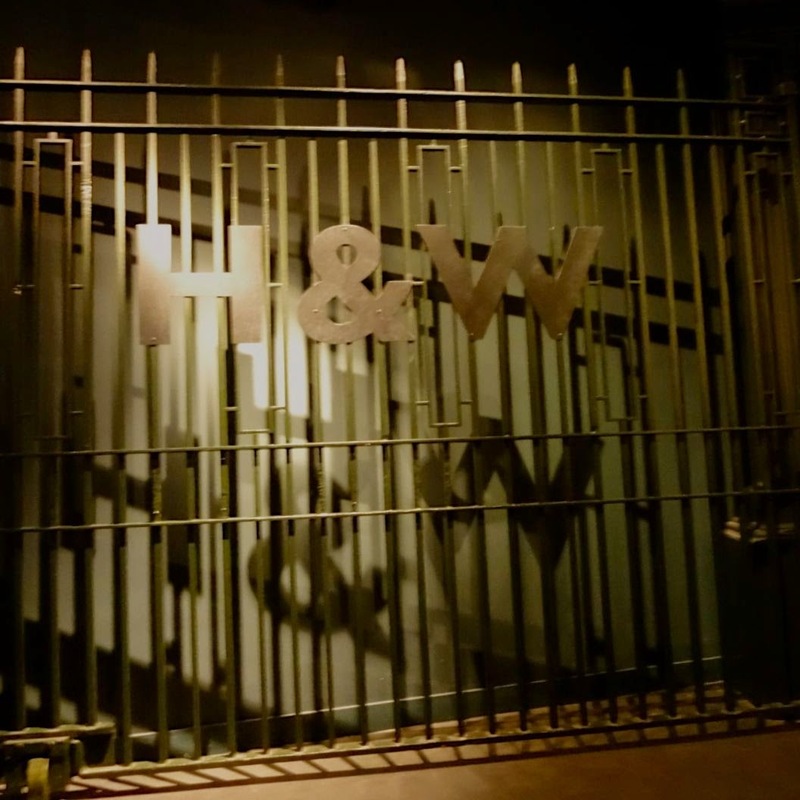 It was well worth a visit – particularly now that the centenary hype has calmed down. Maybe sometime I’ll return with a headset on – or a knowledgeable expert at my side – and soak in a little more of the story of which Belfast is no longer ashamed. 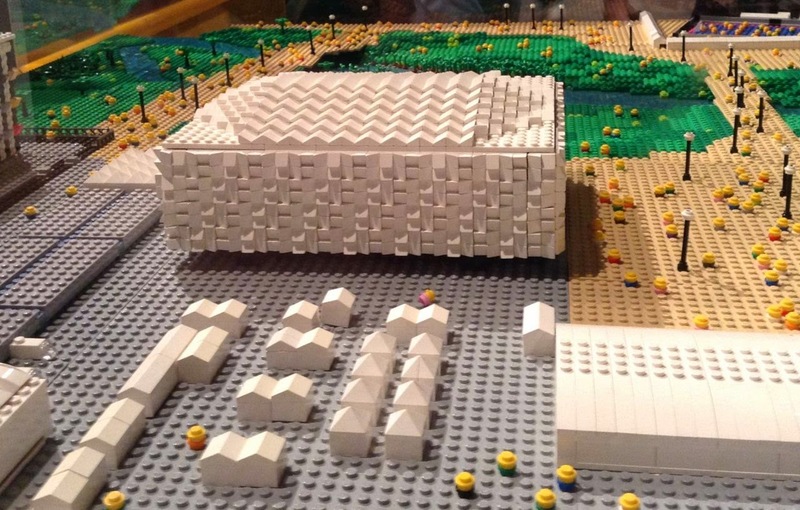 Bricks, Belfast and July ... no not a deterioration in community relations, but the Brick City exhibition in Titanic Belfast! Bricks, Belfast and July usually refers to a deterioration in community relations around the Twelfth. 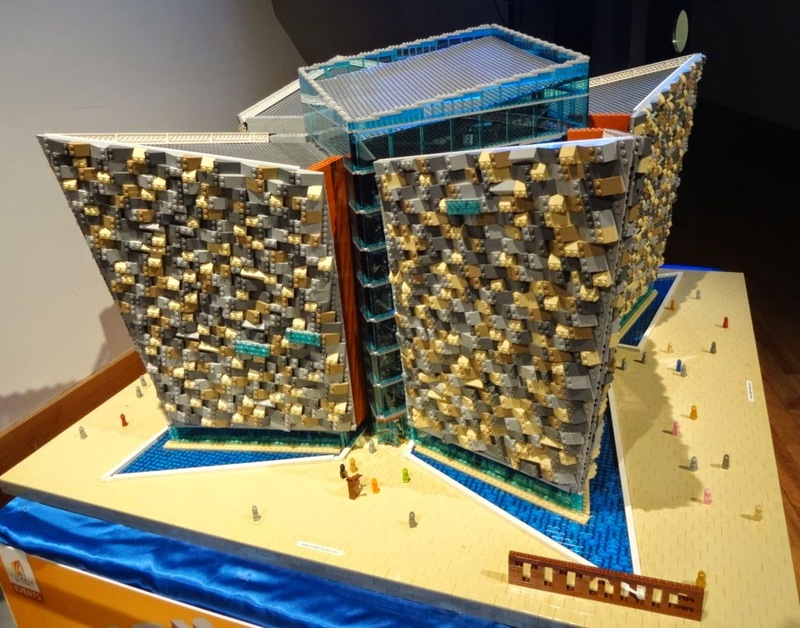 This year, everything was more positive – if not quite awesome – as The Brick City LEGO exhibition continued its residency it Titanic Belfast. 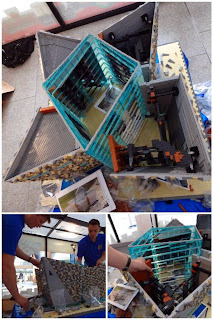 Today we worshipped at the temple of LEGO, its last day. The scale of some of the pieces was extraordinary. But the ingenious use of pieces bricks from one genre of set to pull off an effect in a completely different creation was pretty cunning too. And the penguins (no photo!) were so cute. I chatted to the two master builders who created the glued together the LEGO model of Titanic Belfast in Victoria Square in the run up to the exhibition opening back in May. The finished model was a great replica. Though it was a shame the timelapse video of the build and interviews playing in the background behind the model had the sound muted. The Westminster Abbey model was good, but pride of place in the show was definitely Warren Elsmore’s St Pancras railway station which just needed some train sounds and a flickering departure board to complete it. 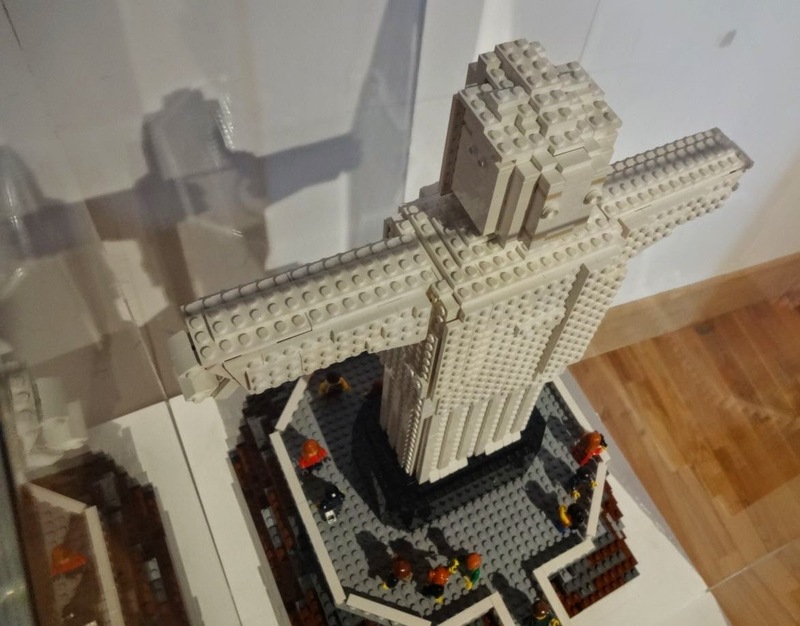 The Christ the Redeemer statue that overlooks Rio had been modified to portray a LEGO man rather than Jesus. 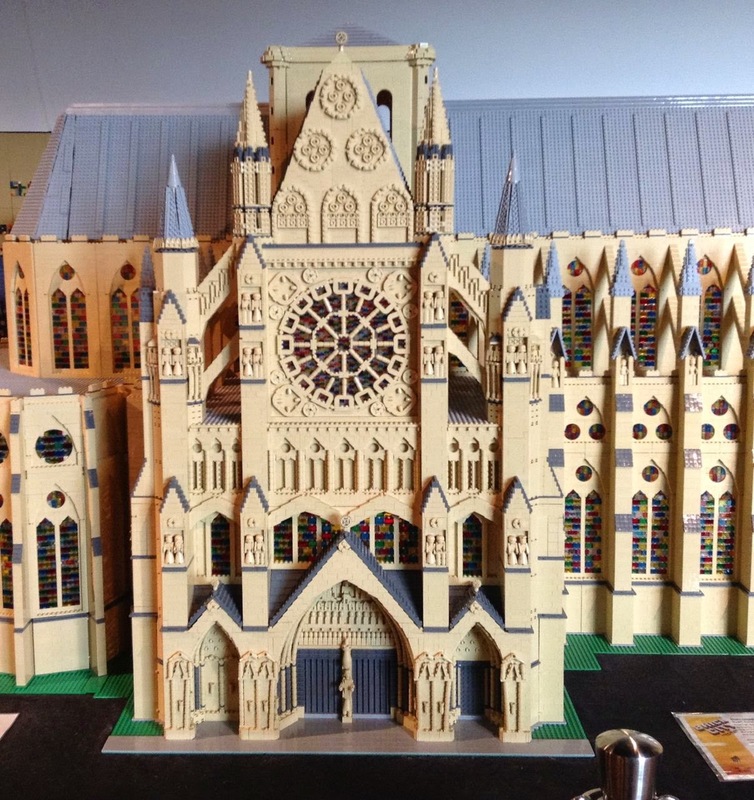 Since Western Christians depict Jesus as a blond haired white man in church stained glass windows, why shouldn’t Brick City use their own familiar shape? 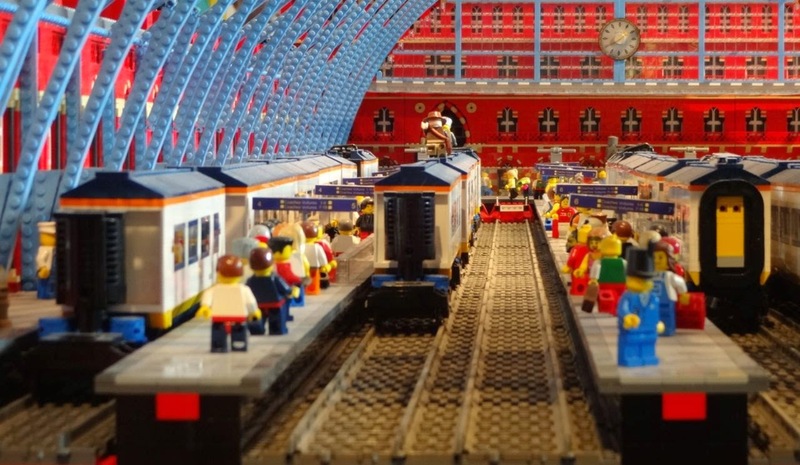 A couple of screens played stop/go animations using LEGO. Hopefully they’ll motivate some local movie-makers to produce and upload some more. One downside of the exhibition was the spotlighting of the displays, which was making everyone’s photography very difficult. Flat shiny surfaces and bright spotlights in an otherwise dull room weren’t a great combination. You can read more about many of the models on display in Warren Elsmore’s books Brick City and Brick Wonders . 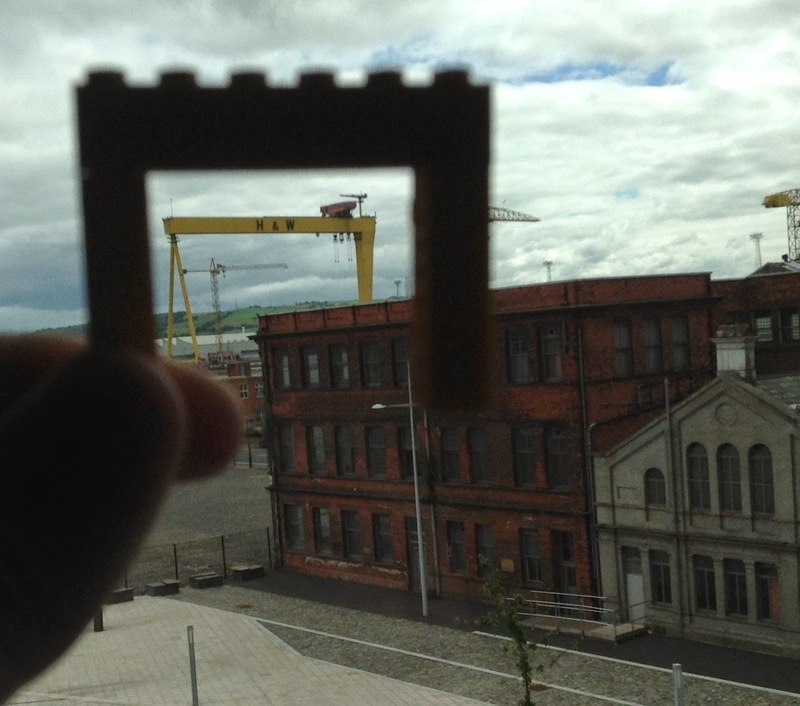 Did you visit Brick City while it was in Belfast? What did you think? 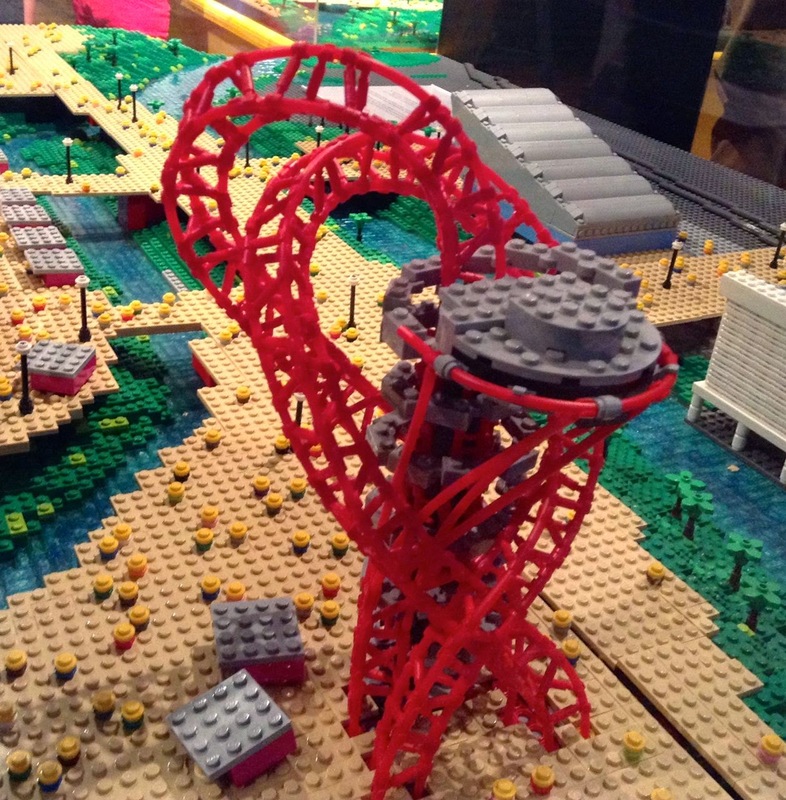 Did it inspire you to dig your old LEGO out of your roofspace? Was it worth the entrance fee? Those of us of a certain age grew up in “the home computer generation”. Hours were spent playing games on our ZX Spectrums: first Breakout (which came on Sinclair’s original tape and was easy to re-programme), Jet Pac, Manic Miner and Jet Set Willy, the Live Aid compendium tape ... These and many other titles filled our portable TV screens and taught us to use double-deck tape recorders until we grew up and longed to programme BBC Micros with their built in assembler and floppy drives to write more efficient and faster running machine code. The wizards of those days wrote games. While many of wrote adventure games in BASIC and typed in listings from magazines, the read nerds overcame the limitations of these tiny computers with a mere 48 KB of memory – about the same your SIM card has to store 250 contacts! – to shoe horn craft amazing games that seemed to cram more and more into the black lump of plastic. Their trick was to write the code and compile it on other machines – TRS-80s and PCs – and then squirt the finished product down a serial cable to the ZX Spectrum to play and test before mastering on a tape and getting them duplicated. Over the last 25 years, software has become bloatware, growing in size with each new release of word processor, spreadsheet or internet browser. Even the arrival of smartphones with their more modest on-board memory hasn’t quite nipped the swollen codebase problem in the bud. But back in the days of 8-bit computers, ingenuity and cunning had to be employed to squeeze games into the limited memory. Everything was compressed and reused; code was self-modifying to make room for extra features and sound tracks. 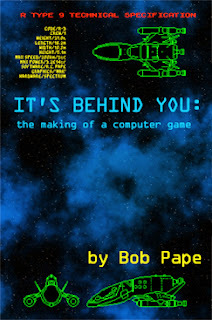 Bob Pape has recently written up his account of working in the software industry in the 1980s. It’s Behind You is freely available for Kindle as well as PDF and can be enjoyably read in a day. Bob wasn’t a Matthew Smith (programmer behind Manic Miner and Jet Set Willy … though not the sequel JSW II). He didn’t earn megabucks. But despite being underpaid and underappreciated, he did push the early 8-bit ZX Spectrum computer to its limit, and went on to write games for a number of other platforms. In the book he describes his route from mainframe programmer to creating Rampage (an arcade conversion) and later R-Type. There are a few typos throughout the book – much like my blog posts – but they don’t distract from the personal and technical tale. It’s a first person account of talent combined with a determination to complete, exploitation by seedy managers and an unreliable web of companies, sleeping on the floor of software offices across Wales and England, and the less than transparent computer magazine industry. Sadly, it’s one tale of many, and the poor pay and conditions of the 1980s will have been common place. … one more ‘review’ that for all intents and purposes just reprinted the instruction manual. As teenagers all we knew about the computer industry was what we read in computer magazines, and that was terribly sanitised. It’s only know that accounts are available from survivors like Bob Pape that we realise that magazine reviews were being written before games were complete, often publishing early artwork and giving usability scores based on demos rather than full versions. 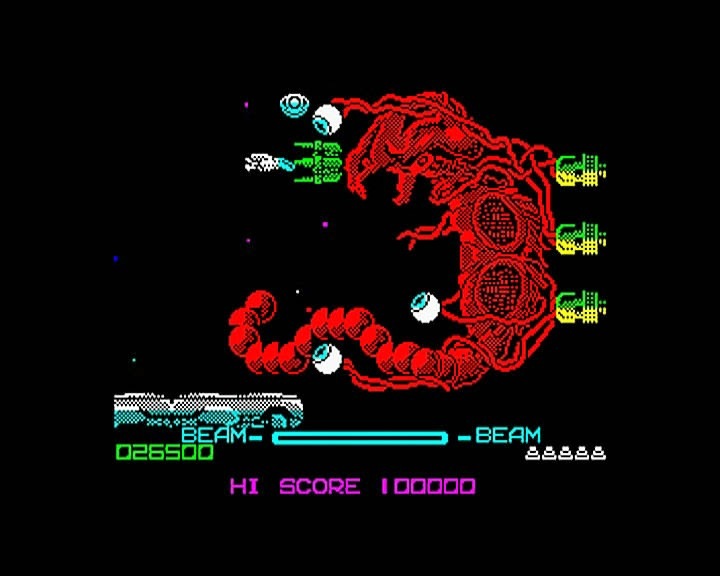 Battling his way through the 8-level arcade game conversion onto the ZX Spectrum – using a video of the arcade version being played along with a few hours of looking at the real thing – Bob produced a better-than-expected reproduction that was well received by the industry and players alike. Frustratingly, Bob discovered – through a reader’s letter in a magazine – that the Spectrum version of R-Type that went on sale got stuck at the end of level 7, meaning that his final level and congratulatory scrolling message were not seen by players until later releases. I’m really glad Bob Pape took the time to write up his recollections and experiences. It’s reminded me of the addiction of writing programmes that I oddly shook off at some point ten or fifteen years ago, and the satisfaction of overcoming limited technical resources through guile and slyness to construct pleasing solutions and useful or fun programmes. And it’s provided new insights into an industry that I was too young to appreciate or doubt … and demonstrated that software testing was as bad back then as it continues to be in some teams today.